Put in a formula that tells members (and Board members) how to determine how much should be in reserves and how much should typically be added to reserves on a yearly basis. Commit to increasing transparency by doing a single topic blog post at the end of each fiscal year on the state of reserves all changes to reserved during that period, and whether current reserves are at or above the level defined in in the reserves policy per item #1 above. Remove or seriously edit item 7 from the existing policy that states details of the reserves are confidential outside the Board. Certainly we do not expect account numbers to be shared, but beyond that I see no reason for confidentiality or having to ask anyone to see the state of the reserves. 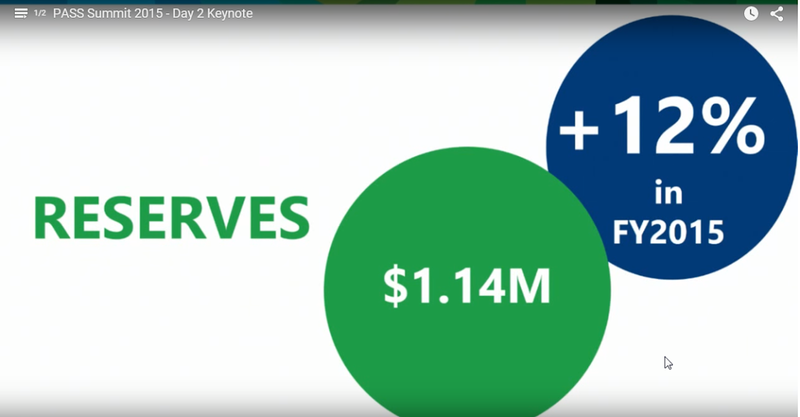 Note 2: At that time I started this post (see slide below) the reserves were set at $1.14 mil. Per the March 2018 quarterly statement reserves are at $1.16 mil. I don’t have details on if there were deposits/withdrawals made from Nov 2015 to Jun 2018. PASS carries insurance to guard against a massive incident, but it can take a long time for the claim to be settled – as much as 18 months. Insurance alone doesn’t guarantee that the org can survive. PASS has also supplemented their cash position with a line of credit, most recently one for $250k according to the June 2014 audit results. Credit lines aren’t without downsides. The one PASS has was at prime plus 5.25%, so it’s not cheap, and there is also the risk that a credit line can be reduced or revoked if the lender believes that the organization is no longer as credit worthy. Reserves are a good thing, to a point. Every business struggles with how much to set aside versus how much to invest back into operations. Cash (or equivalent, such as a CD) doesn’t earn much right now, maybe one percent, compared to using that money to grow attendance/revenue. We analyze a charity’s working capital ratio by determining how long it could sustain its current programs without generating new revenue. To obtain this ratio, we divide the charity’s working capital by its total expenses, including payments to affiliates, for the most recent fiscal year. For example, Charity Z holds $5.4 million in working capital. Its total expenses for the most recent fiscal year are $3.6 million, including a $100,000 payment to an affiliate for its national dues. Thus, it has a working capital ratio of 1.5 years. I don’t know if we have sufficient reserves or not. We have enough to weather a minor storm and that is good, but I want to be sure that PASS can survive and thrive even through the worst event. PASS worked with the auditor to determine that that 22.8% to 32.7% of the total assets should be invested. In Nov 2015 that stood at 27.6%. I was thrilled to see a formal reserves policy (added April 2017) that requires a Board vote to move money in/out of reserves, but it doesn’t specify or suggest what level should be maintained during “normal” operations. I think incoming Board members need that kind of level-set to help them assess and vote well on motions related to reserves. Having looked at what I could find via PASS and on the web, I still don’t have a good answer to “do we have enough”. The 2017 budget has $2 million for corporate administration (HQ), but there are plenty of other expenses. I’d guess we have enough cash/credit for 3-6 months, giving us enough time to make hard choices about reducing costs if needed. The big variable is the float on Summit registrations. If the Summit is just delayed there will be some refunds, but many will just go to the rescheduled date. Thinking about it more, the percentage thing may be fine, but I’d be happier if we also had a rule that said we had to carry enough for x months expenses. I’d like to see more discussion on that. I’d also like to see the Board post a state of the reserve post once a year showing the current state, any changes, plus any line of credit or other items used to supplement the core reserve. If we could see that in a year over year document it would be really clear what we have.